It didn’t take long for New York City to see its first baby of the new year. Flushing Hospital in Queens says it has the first newborn of 2018 – a baby girl born at 12:01 a.m. Monday. The baby girl weighed in a four pounds and 11 ounces and is 18 inches long. The mother, Tania Shirin, has named the baby Ariana. The hospital said her and the baby are both doing well. 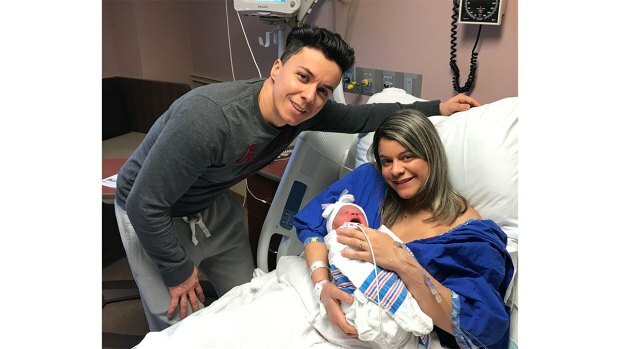 Meanwhile, in New Jersey, Hackensack Meridian announced that its welcomed Bergen County's first baby of the year at 12:03 a.m.
Micayla Araujo weight 5 pounds, 11 ounces and was 18 inches long. She is the second child of Manny Araujo and Lainne Afonso, of Kerney, who also have a 7-year-old son. Parents Manny Araujo and Lainne Afonso, of Kearny, with their baby Micayla Araujo, who was the first baby born in Bergen County n 2018. And on Long Island, Northwell Health welcomed it's the first baby of 2018 at 12:19 a.m.
Aziya Dream Shingler weighed 5 pounds, 10 ounces when she was born after 17 hours of labor. She's the fourth daughter of Tamari Gardner and Aaron Shingler, of Hempstead. Parents Tamari Gardner and Aaron Shingler welcomed baby Aziya Dream Shingler at 12:19 a.m.